Johannesburg - As a kid she’d often go home in tears after another day of being bullied. She wasn’t fair skinned enough, her hair wasn’t silky enough, she wasn’t pretty enough, her schoolmates would tell her. “They called me an ugly duckling,” Mariechan Luiters recalls. But her grandmother would tell her not to listen to a word. “Once while she was hanging up washing I climbed a tree and said to her, ‘I wish kids would stop making fun of me – I wish I could be as pretty as the flowers on the tree'. Wise words indeed – because that is exactly what Mariechan did. Those bullies at her school in Stellenbosch have been proven wrong time and time again. 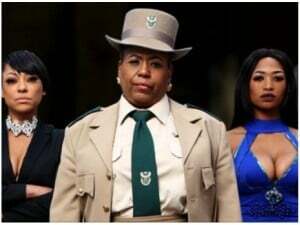 As a member of the all-female group Jamali, she went from being an ordinary small-town girl to living the high life in Joburg with regular TV appearances, nonstop gigs and songs that played on every major radio station in Mzansi. But after several years – when it seemed Jamali had run its course – she knew it was time to reinvent herself as a solo artist. It took the singer nearly four years to shape her career to the point where she isn’t just the girl from Jamali anymore. Mariechan is a star in her own right, featuring on singles with the likes of DJ Ganyani, DJ Qness, Euphonik, rappers Blayze, ProKid, Reason, Riky Rick and most recently Shekhinah’s Different. But she isn’t just singing on other people’s records: she recently released her debut single, Missed Calls, and is working hard on her upcoming EP, due to drop in November. It will be called Cherry Blossom in honour of her beloved late grandmother. “My grandmother had a cherry blossom tree outside her bedroom,” she tells us. It was her gran’s favourite tree and the one she compared her insecure granddaughter to. Mariechan has always loved singing. Growing up in the wineland town of Stellenbosch her younger siblings – Chantal (now 34) and Sydwill (now 30) – and her few friends called her a “human jukebox” and asked her to sing Whitney Houston songs. Music was her calling, she says, and singing is the only thing she’s ever wanted to do. She didn’t study music because her family couldn’t afford to send her to university and she’s had no formal singing training. But she had plenty of experience singing at school concerts and beauty pageants. To make ends meet after school she worked at Woolworths manning the fitting rooms. “I would go in the cubicles and pretend to be tidying up, but I’d be singing and performing in front of the mirror,” she recalls. Her big break came in 2003 at a Coca- Cola Popstars audition in Cape Town. Mariechan gave the SABC1 talent contest a go the year before but didn’t make it so she decided to give it another try. But of course they did. She became part of the group Jamali, which came second overall and went on to become a household name in South Africa. For three years everything was going great. Jamali was climbing up pop charts, selling out in record stores and playing at concerts around the country. Then in 2006, when Jamali was recording their second album, she became pregnant with her son, Blade (now 12), and had to leave the group. She and her baby daddy broke-up before Blade was born and being suddenly single and a mom-to-be was “a big shock” for Mariechan. She returned home to her parents after having to train a replacement for Jamali’s live performances. After giving birth she stayed at home for three months. “I had no friends at the time,” she says, although the girls from Jamali – Jacqui Carpede and Liesl Penniken – stuck by her. Life got better after the birth of her baby and with the help and support of her family, bandmates and church, she was ready to prove herself capable of living her dream. She went back to Jamali and the band recorded four albums in all before the trio decided to part ways in 2014 after a decade together. She has no regrets about the split. She and the other two members remain firm friends and occasionally perform together as Jamali, mostly at corporate events, but have no intention of recording together again or touring as a group. “But I do miss the band,” Mariechan admits. “It gets lonely on stage and we built a sisterly bond that can never be replaced by fame or fortune.” Jacqui runs her own production company while Liesl also performs as a solo artist. After the split Mariechan did a lot of adverts, voiceovers and jingles “while I tried to figure myself out”. After being featured on tracks by other stars, Mariechan began writing her own music and describes her style as “honest with a touch of reggae and dancehall”. Her granny was right, she says – her career has indeed blossomed, just like that cherry blossom tree.